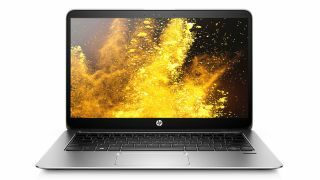 HP has launched a new premium thin and light 13.3-inch business notebook with some smart design touches and a good dollop of battery life. The EliteBook 1030 boasts an almost edge-to-edge Gorilla Glass display, meaning that the 13.3-inch screen has very little surround and can be fitted into as compact a chassis as possible, while also looking very nifty. There's a choice of a full HD screen with no touch support, or a QHD+ touchscreen with a resolution of 3200 x 1800. You also get to choose from a selection of Intel Core M Skylake processors (including the Core m7), up to 16GB of system memory, and up to 512GB SSD on the storage front (with a 256GB PCIe-based SSD option). For connectivity, there's 802.11ac Wi-Fi and Bluetooth 4.2, and in terms of ports HP has provided a USB Type-C port, twin USB 3.0 ports, and an HDMI connector. The EliteBook 1030 also benefits from a fanless design so this is a silent machine, and HP claims you get up to 13 hours of battery life with this laptop. Throw in Bang & Olufsen tuned speakers, a premium spill-resistant backlit keyboard, along with a spacious touchpad and all-metal chassis, and you've got a tempting business notebook. Features aimed at businesses include identity protection with a fingerprint reader, and data protection which is delivered via HP Sure Start with Dynamic Protection, a secure and 'self-healing' BIOS. The EliteBook 1030 will be out soon and starts at $1,249 (around £865, or AU$1,705) on the HP website.